I chucked the tank I started using the SWTC Intensity, because I decided I'd rather use the variegated yarn for Heatwave. So here's my second try. After ordering some SWTC in cobalt, I cast on again, and have finally gotten to finishing the front. I don't LOVE knitting with bamboo, because it feel so stiff to me, but I do really like the fabric it produces. Perhaps because it's so drapey, the garment seems to come out really big even if you get gauge on the swatch, so I'm knitting the smallest size, which seems absurdly small compared to my actual bust size. I did add some short rows to the front to make sure it was long enough that I don't flash people through the lace section. Otherwise, I'm continuing on and hoping for the best. I love the colour. 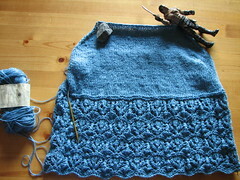 I'm quite enjoying the crispness of the bamboo, and find it less wearing to knit than cotton. I'm sure they will be lovely and drapey, anyway. I like your cobalt blue! Amazing, isn't what different dye lots look like. But yes, I do like the cobalt blue!